Scientists report the discovery of a mysterious structure in the Sea of Galilee on the SW “corner” near the site of Bet Yerah. According to Live Science here, this structure is made of large basalt blocks. These volcanic stones are common in the region. You will need to check the Live Science report, or the original scholarly article from International Journal of Nautical Archaeology (Vol. 42: Issue 1; March 2013) here or here (pdf). There you will find a map, photos and drawings of the structure. I stopped very near the spot of the structure to make some photos of ripe date palms a few years ago. 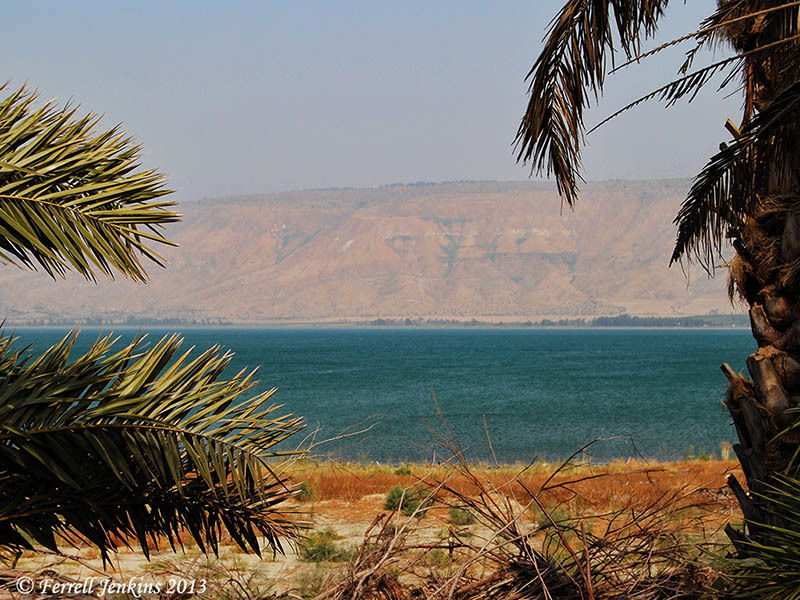 The Sea of Galilee near Bet Yerah. The view is to the east across this narrow southern end of the lake. Photo by Ferrell Jenkins. Whatever this structure and it purpose, it seems to have existed long before any of the biblical activity recorded in the region. This entry was posted in Archaeology, Bible Study, Israel, Photography, Travel and tagged Nautical Archaeology, Sea of Galilee, Stone Structure, Underwater Archaeology. Bookmark the permalink. The Grand Court and two other new hotels have been built where the no-man’s land was before 1967. This is a fine area for you. You have a major street behind the hotel. Is the Grand Court Hotel in Jerusalem in the West Bank? I’m using the border line on Google Earth and it looks like it is just by the line on the Isaeli side. I’ve wondered about this and your comment about not taking the rental car across the line makes me wonder whether I should look for another hotel. Thanks. I did not know any of this so it is helpful. Craig, I trust you will have an enjoyable visit. Be sure to remember that you are not allowed to drive the Israeli rental car in the West Bank. Also, if you use Hwy. 6 the fee will be charged to your credit card about a month later. Full length from Galilee to exit for Jerusalem might be less than $20.